Stevenage had opened the scoring in the 48th minute when substitute Alex Reid nodded in a cross. Ollie Palmer pulled Reds back on to level terms with a 53rd minute headed goal. However two late goals by Alex Revell in the 88th minute and in the fifth minute of added-time sealed victory for Stevenage. Harry Kewell named an unchanged side from that which won their opening game last week 1-0 away at Cheltenham. He handed five players home debuts, Ollie Palmer, Dominic Polean, George Francomb and Filipe Morais in attack, and Romain Vincelot in central defence who also wore the captain’s armband. with striker Kurtis Guthrie, a new signing from Colchester United. It was a quiet opening half hour with the two sides sizing each other up and neither getting on top. There was just one chance for each side in this period with Guthrie firing narrowly wide and George Francomb heading a corner-kick over the bar. The visitors made an early substitution when Alex Reid replaced Danny Newton in the 37th minute following an injury. Josh Payne had shot from the edge of the area, blocked, causing the ball to roll harmlessly to keeper Paul Farman. Finally former Brighton & Hove Albion striker Alex Revell crossed frrom the right to James Ball whose header went inches away from the far post. The game exploded into action three minutes after the start of the second half when Reid nodded Stevenage into the lead from a cross. Reds responded immediately when Dannie Bulman shot narrowly wide in a busy penalty area. Five minutes after the vistitors took the lead Palmer scored his second goal of the season to head in a cross by Morais. Reis went close to regaining the lead for Stevenage when he received a ball by Revell, cut inside and fired inches wide of the target. 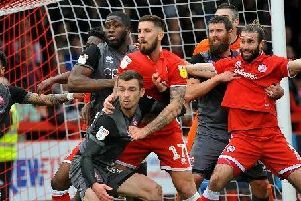 Glenn Morris came to Crawley’s rescue in the last ten minutes with a save to deny Senupe before substitute Mark Randall cleared off the line. Revell regained Stevenage the lead with an 88th minute header, sending the visiting fans into rapture. Revell then rubbed salt into the wounds by seizing on a defensive mistake to score Stevenage’s third goal deep into added-time.